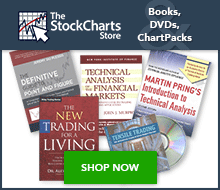 This section describes the various kinds of financial charts that we provide here at StockCharts.com. The articles below describe how the charts are constructed and how they can be used to make better investing decisions. What Are Charts? We discuss what charts are, how to pick timeframes, how charts are formed and the different types of price scaling. Support and Resistance We explain what support and resistance are, where they are established and the methods used to establish them. Trend Lines What are trend lines? We examine this question along with scale settings, validation, angles and more. Gaps and Gap Analysis We examine the concept of gaps (areas on price charts in which no trades occur) and what they imply regarding the fundamentals or mass psychology surrounding a stock. Introduction to Chart Patterns We give a brief review of what chart patterns are and how you can recognize them. Chart Patterns We present a collection of common chart patterns. Arms CandleVolume A price chart that merges traditional candlesticks with EquiVolume boxes. CandleVolume A price chart that merges traditional candlesticks with volume. Elder Impulse System A charting system developed by Alexander Elder that colors price bars based on simple technical signals. EquiVolume Price boxes that are sized based on their trading volume. Heikin-Ashi A candlestick method that uses price data from two periods instead of one. Kagi Charts A Japanese charting method based on volatility and reversal amounts. Renko Charts A Japanese charting method where boxes rise and fall in 45-degree patterns. Three Line Break Charts A Japanese charting method that ignores time and only represents change in terms of price movements. MarketCarpets A charting tool used to visually scan large groups of securities. Relative Rotation Graphs (RRG Charts) A visualization tool for relative strength and momentum analysis. Seasonality Charts A unique StockCharts tool for identifying monthly seasonal patterns. Introduction to Candlesticks We present an overview of candlesticks, including history, formation and key patterns. Candlesticks and Traditional Chart Analysis We discuss how to use candlesticks with moving averages, volume and chart patterns. Candlesticks and Support We examine how candlestick chart patterns can mark support levels. Candlesticks and Resistance We examine how candlestick chart patterns can mark resistance levels. Candlestick Bullish Reversal Patterns We describe common bullish reversal candlestick patterns in detail. Candlestick Bearish Reversal Patterns We describe common bearish reversal candlestick patterns in detail. Candlestick Pattern Dictionary We present a comprehensive list of common candlestick patterns. Point and Figure Charts We discuss how to use and interpret Point and Figure Charts. Andrews' Pitchfork We illustrate how to draw, adjust and interpret this trend channel tool. Cycles We present the steps to finding cycles and using the Cycle Lines Tool. Fibonacci Retracements We define Fibonacci retracements and show how to use them to identify reversal zones. Fibonacci Arcs We show how Fibonacci Arcs can be used to find reversals. Fibonacci Fans We explain what Fibonacci Fans are and how they can be used. Fibonacci Time Zones We describe what Fibonacci Time Zones are and how they can be used. Quadrant Lines We define Quadrant Lines and show how they can be used to find future support and resistance zones. Raff Regression Channel We examine this channel tool based on two equidistant trend lines on either side of a linear regression. Speed Resistance Lines We present how these retracement-based trend lines are used on charts.